To say that I was excited that there was finally a new LP by Red Dons would be a drastic understatement. Their last LP, Fake Meets Failure, was such a perfect slice of dark, driving and melodic punk rock I could hardly stand the five year wait. Sure there have been a few 7"s here and there, but there's nothing quite the same as a new full album. The Dead Hand Of Tradition is simply a great album. I will admit that my expectations were perhaps unrealistically high. I loved Fake Meets Failure so much, I couldn't help feeling slightly disappointed in the new album the first couple of times I listened to it. I'm not sure what I was expecting exactly and I couldn't tell you what I felt was missing, but I didn't like it quite as much as their prior record. Those initial feelings have been swept away the more I listen to this album. I'm not sure if it's a grower or if it's just easier to appreciate now that I'm more familiar with it. The Dead Hand Of Tradition really an essential album and one of the better records to have been released in 2015. The band is still churning out their Wipers style downstroke heavy punk rock. It's catchy, but deadly serious and if you have even passing interest in bands like The Estranged or Hot Snakes, you really need to give these guys a shot. Taken By Surprise had pressed up a limited amount on white vinyl which seem to be sold out now. I normally like to put the number of colored vinyl in the title of my review, but digging around I can't seem to find how many came out on white. If you happen to know, pop me a line and I'll update this review. If nothing else, I try to document this sort of thing for the other nerds like me out there. 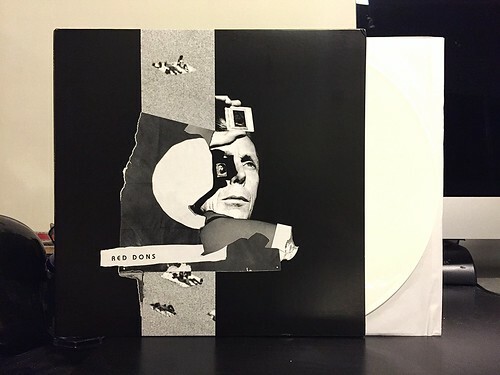 Update: There were 200 on white vinyl. 100 sold by the label and 100 sold by the band on tour. Thanks for the info Michl!